Now you have seen our dogs. You probably know that they are the "Dutch National Dog" and sometimes also called the "Dutch Bargedogs", and we, the owners, also originate from The Netherlands. We are aged pensioners, we have three married children, with a total of eleven grandchildren. We live in NSW, in the Southern Highlands, close to Mittagong on a 5 acre property. Our dogs are not kept in kennels, when we are at home, and that is most of the time, they are free to come in and out our big living-in kitchen. Overnight they sleep each in its own quarters in a big shed next to the house. As we have told you on the above we have 11 grandchildren, who are all very fond of our dogs or any other animal, if it comes to the point. They all have pets, either a dog, cats, rabbits or birds. And our dogs are therefore very well used to children of all ages. This fellow produced a very good and smart line. We now breed the Keeshond for 23 years, and ofcourse we are patriottic as we are ourselves from The Netherlands. 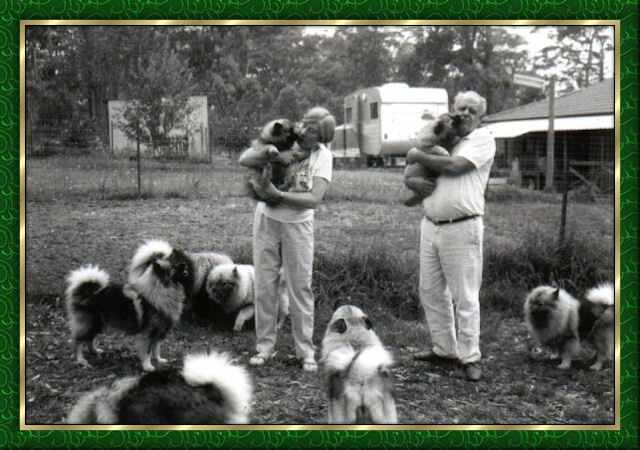 We also belong to the Dutch Keeshond club, and are frequently in contact with the breeders overthere. Over the years the Keeshond has given us some very good times, laughs and affections, and they still do. As it is a dog that likes to please his owners. But also has a mind of itself. They go along very well with children and other pets as Cats (see the Compagnion page). The Australian climate has no effect on them, as long as they can be in an airconditioned area, when the weather becomes extreem. They really behave as The Laughing Dutchman. my granddaughter, a hot day, a beautifull boy. Suitkees Dondersteen, what pups do on a hot day, Suitkees Koninklijk.